The influential Vote Climate candidate analysis has been released for the Melbourne by-election. Put together by local community groups, Vote Climate ranks and analyses the global warming policies of candidates via a questionnaire and independent research. “Our aim is to sort the wheat from the chaff and provide the voting public with information”, Pablo Brait, Yarra Climate Action Now Convener and Vote Climate volunteer said. “As the climate crisis is the most important issue Victorians face, we encourage all voters to choose their preferences based on climate policy”. The top rated candidate is independent Adrian Whitehead, who is running on a climate action platform. Second best candidate is Cathy Oke from the Greens. “Our scorecard will now be letterboxed across thousands of homes in the seat of Melbourne, and our website is available for everyone to look at.” Mr Brait said. “Ted Baillieu’s Government is ignoring the climate crisis and pushing for huge increases in coal and gas mining across the state. His Government has destroyed jobs in the wind and solar energy industries. We urge voters to send him a message by voting for the candidates most committed to climate action”, Mr Brait concluded. Yesterday Julia Gillard announced some of the Labor Party’s climate policies. Debate amongst the YCAN team has centred on whether these are the worst policies ever, or the second worst. The Labor Party cannot even pretend to care about climate change now. These policies will see Australia’s emissions continue to rise rapidly while the impacts of climate change keep worsening. Twelve new coal-fired power stations on the drawing board around Australia have been given the go-ahead. Any new plants beyond these will be subject to “emissions standards”, which will only block brown coal developments, but not black coal. Further, all new coal plants (the phrase “new coal plants” shouldn’t exist in and of itself as we should not be building any) will need to be “carbon capture and storage ready” – something that is completely meaningless. Existing polluting infrastructure, such as Hazelwood Power Station remain untouched. The “citizens assembly”, due to report in over 12 months is just an excuse for inaction, when urgent action is desperately needed. Community consensus on climate action has existed for years, and scientific consensus has existed well before that. We want action, not more talk! Money will be taken away from the solar infrastructure program to fund rebates for car owners to purchase a new car if their car is older than 1995. For further information see the Vote Climate website. It’s hard to describe just how truly wretched Labor’s new climate change policy is. It makes the CPRS, its dog of an emissions trading scheme, look like a model of best practice. It is a spectacular failure of leadership. Julia Gillard’s “citizens’ assembly” has effectively outsourced responsibility for climate policy to “ordinary Australians”, on whose “skills, capacity, decency and plain common sense” Gillard will rely to tell her about the community consensus on climate change. In effect it institutionalises what is already apparent — this is a Government controlled by focus group reactions. Labor has been playing politics with climate change for three years and it hasn’t stopped. But whereas for most of that time it used climate change to damage the Coalition, now it is having to defend itself against the issue. It will only be with the political cover afforded by this nonsensical Assembly that the Government will take any action on a carbon price. Rarely has so much goodwill and political capital been wasted on such an important issue. The consensus the Government insists it needs the protection of before acting already exists. It’s not just in the opinion polls, which show time and time again that the majority of voters want action on climate change and supported the Government’s CPRS. In 2007, let’s not forget, both sides of politics told Australians they were going to introduce an ETS. The 2007 election endorsed a community consensus on the need for action. Instead, in 2010, neither party will commit to any sort of carbon price mechanism for at least three years. Instead, they’re offering excuses as to why they don’t want to take action. We’ve done anything but move forward on climate action. Gillard’s interim actions are little better. The new emissions standard she proposes won’t even apply to four coal-fired power stations being built or brought back on line currently. They may not apply to two more, the massive Mt Piper and Bayswater projects in NSW, which will together add 4% to national CO2-equivalent emissions when they come on line. Holding the baseline for the CPRS at 2008 levels won’t give electricity generators any more investment certainty when it remains unclear whether there will ever be an emissions trading scheme in Australia. Nor does it change the simple fact that State Governments continue to drive Australia into a coal-fired future. Labor’s craven pandering to key outer-suburban electorates in its population and asylum seeker policies was bad enough. But abdicating executive responsibility for action on climate change is a new low in cynical politics, beyond the depths even reached by NSW Labor. Politicians are elected to lead. Deferring every controversial issue back to the electorate is a clumsy variant of leadership by polling and focus groups. So blatant is Labor’s refusal to lead that it raises serious questions about its fitness for government. The only problem is that the alternative is an economically-illiterate party whose leader doesn’t believe in climate change at all, but who insists on wasting $3b on the most expensive possible means of addressing it. What a choice, two major parties incapable of leadership and unfit to govern. 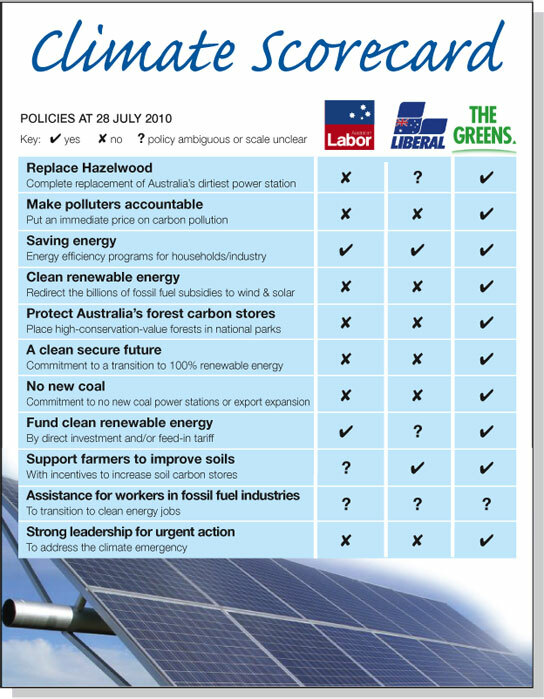 Federal Election Called – help make climate the key issue? The election has been called and the circus begins. Amongst the sea of spin and annoying catch phrases, it can be hard to find some substance – and sometimes, the best thing to do is to create it! We need you to help with the Vote Climate campaign. YCAN, together with several other local community groups will be running the Vote Climate campaign for the next five weeks. This will be a non-partisan campaign, which aims to educate the public on the different climate policies of the three main parties. We want to inform voters and encourage them to vote for action on climate change. With your help we can ensure that the climate crisis stays on the election agenda. Can you help? We need volunteers to letterbox, attend stalls and attend pre-poll and polling day booths. If you are interested in helping out then please fill out the web form here. Don’t let the polluters, deniers and delayers bury climate change in this election – sign up to volunteer for Vote Climate.